You all know .exe wrapper for jar files (like JSmooth). They are used to execute jar files and makes it more comfortable for end users to work with, because they are used to .exe files. The problem is that you only can execute these generated files on Windows systems. For instance I started to implement a streaming video server with the Java Media Framework. Then I wanted to ship my application to another system, but the application didn't run because of dependency issues. I chose number 2 to be more platform independent and to free the user from installing unnecessary software. Now the problem was that I had to build a jar which dynamically extracts and loads these librarys into the library path. Unfortunately Java does not support setting the java.library.path dynamically at runtime, that's why you have to set it when starting the JVM. With this argument we tell the Runtime to look into the dlls directory for some librarys we might need. Then we can call System.load("mydependency.dll"); to make it available for access. Summing all these issues up and having in mind not to use an .exe file I developed my own executable jar generator. 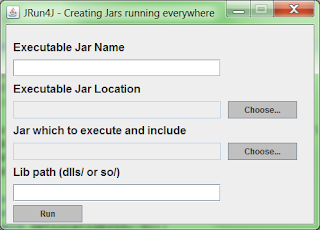 The Executable Jar Name is the resulting Jar file containing the system specific jar. The Executable Jar Location is where you want to save the generated Jar file to. Then you can specify the including jar file. And at last in which folder the dependent librarys can be found. If you click on generate the executable Jar File will be generated.